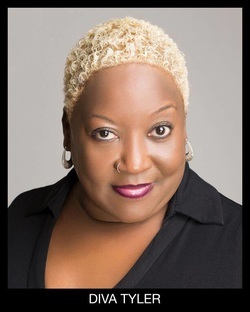 Diva Tyler is an accomplished actress, speaker and life coach who believes that it's never too late to pursue your wildest dreams. Since turning 50, she has completed two half-marathons and has decided to train for a third one, climbed Machu Picchu, hiked the Yosemite Mountains, ventured on a 3-month mission in Peru, started a non-profit organization and has begun a career in television & film. She works globally in the important areas of sexual child abuse prevention and commercially sexually exploited children (CSEC). When she's not acting, Diva can be found mentoring & volunteering. As the founder of Not On My Watch, she focuses on working with children who have been victims of abuse and neglect. She also can be found conducting therapeutic workshops, leading life coaching classes and facilitating women's retreats for organizations throughout Atlanta. Diva has developed herself to a level that enables her to see the greatest potential in every one she meets. She is an enlightened soul that is immersed in moving individuals towards their own passion & purpose and has created specific strategies to awaken your inner Diva with Desire Intention Vision & Action. "Diva is a true servant to her higher calling. Miss Diva teaches an inspirational life coaching class that.. introduces the concept of spiritual cross training and has boosted the outlook of success in many of our [client] lives." - Dianne Beavers, co-owner of There's Another Option Therapeutic Recovery Residence.